Your group will provide that added extra element of individual care and attention for the children in the centre where you’ll work, many of whom will have been orphaned or abandoned by parents who cannot afford to support them. You will become involved in a wide range of activities; including helping staff with basic care duties, helping with homework and running classes or workshops where you focus on painting, pottery or music with a group of children. There are also opportunities to help look after the home's garden or pets and maybe even arrange a day trip for the children. Your group will be taking Spanish lessons alongside the Care element of your project and you will have plenty of opportunity to put your new vocabulary into practice; both with the children at your placement and with your host family. Classes will be interactive and intensive and will be tailored to your level to ensure you to benefit fully from the lessons. Argentina is the second largest country in South America and a place of extremes. You'll be amazed by the breathtaking scenery and great diversity in its landscapes. You'll be living with a local host family in Unquillo which will give you a good insight into Argentinean life and culture. Located 25 km from Cordoba - Argentina's second-largest city - Unquillo is a vibrant town nestling in an attractive region. Unquillo has many beautiful buildings from the early 20th century and was a major tourist destination in the region. 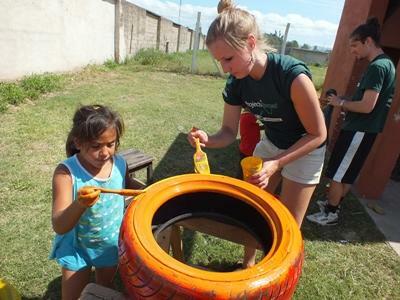 As a volunteer in Unquillo you'll feel comfortable and very welcome.